What's in a Gauge — Gamut Music. Inc. So many strings, so many gauges. What does it mean, anyway, to use one gauge or another; what difference does it make? This is a question that comes up frequently in my inbox. Players do realize that there is a reason for a string to be available in different gauges, but the intricacies of the characteristics of different gauges can be confusing, so I thought that I would write out a short explanation to help players with the decision process. Concerning strings, since they are round, the gauge indicates the diameter of the string. This diameter is an indication of the mass or weight of the string, which is important, as the weight of the string is directly related to the tension of the string. Just to recap the basics of strings, they are dependant on three things: length, pitch and weight. Some instruments, like the lute and guitar have a fixed string length. So, there is not a lot that we can do about that feature. Some instruments, like those in the violin, viol and related families, have movable bridges that can alter the string length a little, but essentially, most instruments are designed to have a specific length for the strings. As for the pitch, this is usually fixed as well, although the standard of the pitch can be changed, (a-440, a-415 and so forth), which will affect the pitch by making it either higher or lower by a small amount. So, because the length and pitch of strings are more or less fixed, the one thing we can change, in order to alter the playing characteristics of a string, is the weight of the string. Thicker strings increase the tension. Thinner strings decrease the tension. A heavier gauge makes the string tighter because an increase of weight adds tension to the string. Also, a thicker string is going to be a stiffer string because more material decreases the flexibility of the string. A string that is stiffer and less flexible is going to effect the pizzicato practice in that it will be more work to pluck, because it is, well, stiffer. A heavier, stiffer string will also have less sustain because the energy gets absorbed more quickly, which will have a great influence on pizzicato technique. A thicker, tighter string will have a more restrictive bowing dynamic range because it will take more energy to start the string and keep it going with the bow. Also, slower bow speeds, or lighter bow strokes will not work as well on thicker strings as on thinner ones. Thicker strings will also be less influenced by rotating the bow to change the amount of hair that contacts the string, generally, you will have to have more hair in contact with the string at all times. Gauge also greatly influences the sounding point of the string. The influence of more tension and stiffer construction causes the string to be unresponsive near the bridge and this effect dictates how and where the bow can best create the tone you want out of the instrument. The stiffness of the string is also going to affect the intonation and finger position when stopping the string for different notes. Stiffness in strings has the effect of shortening the stop length. As the acoustical energy travels along a string it is reflected back and forth between the bridge and nut or finger. As strings stiffen, this energy is reflected before it reaches the bridge and finger, causing the string to play sharp. The stiffer and thicker the string, the shorter the effective length of the string becomes. So, on thick, stiff strings, the finger has to allow for a greater length for each note to compensate, allowing notes that are in tune and the correct pitch. 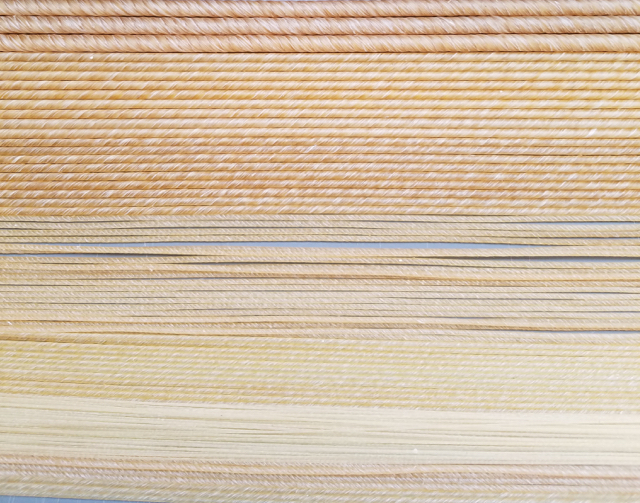 Increasing string tension will have an effect on tone response from the instrument because additional tension will have the mechanical effect of causing the front to stiffen and this stiffening can begin to restrict the vibration of the wood. Sometimes this effect can be moderated by a soundpost adjustment, or somehow changing the angle of strings over the bridge, thereby decreasing the down-bearing pressure on the front from the strings. It should be noted that increasing the down-bearing pressure on the front is not always a bad thing and I have seen instruments that had tone that responded well to increased tension. However, this is one of the considerations to account for when considering string tension. It should be noted that decreasing tension by selecting strings of lighter gauges will, generally speaking, have the opposite effects of the heavier gauges discussed above. So, how is one to choose the best gauge for your style of playing and instrument? Unfortunately, there is no reliable method other than having experience with different types of strings and gauges. However, if you are unhappy with the response of your instrument, or a particular string on your instrument, there are some tricks that can be used to indicate a direction you should take with your next string purchase. Click on the “Quick Calculator” link on the upper left hand corner of the page to bring the calculator to the right side pane of the window. For instance, bass viol C-4 strings are always tricky strings to get exactly right. Let’s say you have a bass viol with a 68cm string length and you are playing at a-415 with a string gauge of 1.42mm. Go to the quick calculator page and put 415 in the “Pitch” field at the top of the column that has the list of frequencies. This will list the C-4 pitch as 123.38Hz, so put that number in the “Frequency” field of the Quick Calculator and 68 in the string length field. Then, change the tension number until you get the string diameter of 1.42mm, which will end up being 5.8Kg. Now, raise the pitch of the string on the instrument to a pitch where the string feels more responsive. Let’s say that this pitch turns out to be D-138.49Hz. Then, go the Quick Calculator and put that number in the frequency field and start changing the tension number until you get the 1.42mm diameter, which in this case is 6.6Kg. What this indicates is that this instrument would sound and play better with a string at a tension of about 8.2Kg. So, leave this number in the tension field, keep the 68 in the string length field and now put the pitch back to the 123.38Hz of the C-4, recalculate, and you will get a new diameter of 1.50mm. This is a good indication that this instrument will sound better and be more responsive with a thicker string. This system can be used to tune strings up and down to find a response that suites you better and is, generally, a successful way to test new gauges. In the case noted above, the 1.50mm string will not respond exactly as the thinner string at the higher pitch, due to all of the other relative differences between the two cases. However, it is a good indication that the thicker string will perform more like the player wants.